The political question doctrine protects certain governmental actions and decisions from judicial review. The doctrine emerged in the United States in the early 19th Century. It reached Ugandan jurisprudence in Ex parte Matovu in 1966. After Matovu, the doctrine existed in relative obscurity in Uganda. The doctrine made a dramatic resurgence in the Constitutional Court’s judgment in Centre of Health Human Rights & Development (CEHURD) and Three Others v. Attorney General. 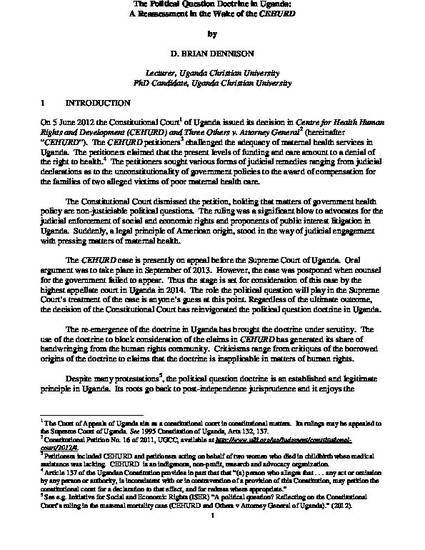 In CEHURD, the Constitutional Court held that the political question doctrine prevented the court from reviewing government policy concerning the provision of maternal health care. The CEHURD judgment ruffled legal pundits and advocacy groups seeking to establish the judicial enforceability of social and economic rights in Uganda. Critics of the CEHURD decision questioned the legitimacy of the political question doctrine and asserted that the doctrine should not apply to matters involving human rights. Despite these protestations, the political question will continue to play a role in the context of economic and social rights. The doctrine springs from a necessary limitation on judicial power. Judicial review has the capacity to erode democracy and distort power balances. Most courts recognize their limited capacity and authority when it comes to matters of social policy and government services. This judicial self-awareness and the resulting judicial discretion are practically enabled through the existence and use of the political question doctrine. Nonetheless, the political question doctrine should not shield courts from addressing threshold issue regarding the existence of economic and social rights.